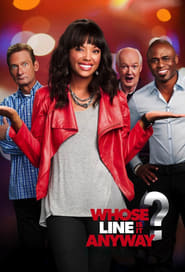 “Whose Line Is It Anyway?” (1998-2007, 2013-) is the US edition of the British show of the same name (with many of the same performers). It features some of the world’s finest improv(isational) comics, including Wayne Brady, Colin Mochrie, Ryan Stiles and Drew Carey (Drew also hosting most shows, Aisha Tyler hosting the 2013 season). Each week, the main four improv comics (and a guest improv comic) spontaneously play “theatre sports” with crazy scenes, weird quirks, or improvised songs.